(AP) WIMBLEDON, England - Venus Williams began her bid for a record fourth gold medal in Olympic tennis Monday by beating Sara Errani of Italy, 6-3, 6-1. It was an impressive showing from Williams, who is unseeded and drew a tough first-round foe. Errani has won four titles this year, was the runner-up at the French Open and is ranked a career-high No. 9. 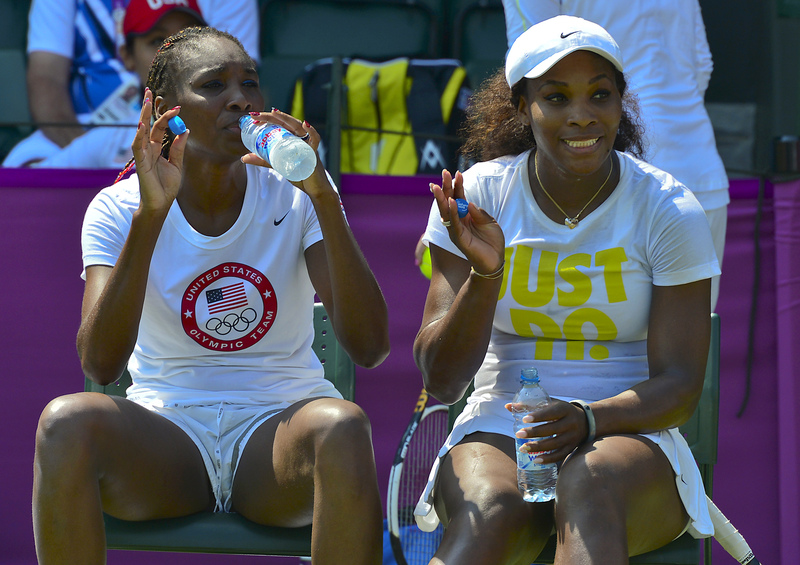 But Williams was in fine form on the Wimbledon grass, where she has won five of her seven Grand Slam titles. Twenty minutes after Williams won on Court 2, younger sister Serena closed out a second-round victory on Court 1, beating Urszula Radwanska of Poland, 6-2, 6-3. Serena defeated Radwanska's sister, Agnieszka, in the Wimbledon final this month. Top-seeded Roger Federer made only a brief appearance on Centre Court, beating Julien Benneteau of France 6-2, 6-2 in less than an hour to reach the third round. Routine wins have been elusive at the Olympics for Federer, who is playing in the Games for the fourth time and still seeking his first singles medal. He was pushed to three sets in the opening round but he easily eliminated Benneteau, who held a two-set lead against Federer at Wimbledon a month ago before losing. Andy Roddick quickly took to Olympic grass, winning his first-round match over Martin Klizan of Slovakia, 7-5, 6-4. Venus Williams was diagnosed last year with an autoimmune disease that can cause fatigue, but she nonetheless began 2012 determined to make the Olympics for the fourth time. She won the gold medal in singles at the 2000 Games and teamed with Serena to take the gold in doubles in 2000 and 2008. Williams served well against Errani and moved forward aggressively, winning 19 points at the net. When Errani double-faulted on match point, Williams trotted to the net with a grin, then shook her fist with glee as spectators chanted "U-S-A! U-S-A!" Roddick converted only two of 13 break-point chances but dominated with his serve, as often happens at Wimbledon, where he's a three-time runner-up. The Olympic match, delayed a day by rain, was Roddick's first in eight years. He lost in the third round at the 2004 Games and skipped Beijing in 2008. As a price for being unseeded, he'll face a daunting challenge in the second round: Novak Djokovic, the 2011 Wimbledon champion. "The guy has been the best player in the world over the last couple of years," Roddick said. "It's going to be tough. But the situation, we've both been through it a million times. I'm going to have to serve well and take some chances on returns." Top-seeded Victoria Azarenka of Belarus defeated Irina-Camelia Begu of Romania on Centre Court, 6-1, 3-6, 6-1. Lleyton Hewitt of Australian and Nikolay Davydenko of Russia, both three-time Olympians, won their opening matches. No. 9-seeded Juan Monaco of Argentina, No. 13 Marin Cilic of Croatia, No. 16 Richard Gasquet of France and big-serving Milos Raonic of Canada also advanced. American Varvara Lepchenko eliminated Veronica Cepede Royg of Paraguay 7-5, 6-7 (6), 6-2. Their match was tied after two sets when suspended Sunday because of rain. Roddick, a dedicated Davis Cup player for the United States, took Court 2 on a sunny morning looking particularly patriotic. He wore a blue shirt, white shorts and stars-and-stripes shoes. "Posh sneakers, Andy," shouted a spectator with a British accent. He lost only nine points in 11 service games, and the first break point came on the final shot of the opening set, which put him ahead to stay. Roddick won with more than just his serve, hitting several improbable shots, including a back-to-the-net lob to help win one point, and a backhand as he did a belly flop behind the baseline.